To a land of myth and magic. That’s what it’s about, that unique feeling, that uplifting of the spirit when you’re out in the open, somewhere beautiful. Green magic is that unexplained energy and force, the natural magic that occurs in nature; it’s there all around us but perhaps not everyone is aware of it, or open to it. Believing in the existence of green magic doesn’t preclude any established religion. It’s the power innate in the natural world, made by whosoever’s “hand” you want to attribute it to. People of all spiritual beliefs acknowledge that magical life force in Nature, and it it goes by many different names. At Stonewylde, it’s called Green Magic. Our ancestors, uncluttered by the complexities of our modern world, were far more in touch with the mysterious forces that surrounded them. The changing seasons, the miracle of growth every spring, animal lore, the return of the sun after winter; all these natural phenomena which we nowadays dismiss airily because we understand the “scientific” reasons behind them, were honoured by people of old. When you live close to Nature, you understand more completely just how very dependent we are on her bounty. By seeing Nature as a manifestation of divinity, the human soul regains something that was lost when we industrialised our Earth. 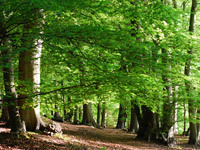 There’s a rapidly growing movement today towards living in harmony with Nature, whatever other spiritual beliefs you hold, and at Stonewylde the community is very aware of the sentience of the landscape. This is not to be confused with eco-awareness. Although it’s vital to halt the damage we do to the environment and ensure we treat the planet with care and respect, Green Magic is a different matter and concerns our psyches and our spiritual well-being. At Stonewylde, we see a society which honours the Old Ways, marking the changing seasons as the Wheel of the Year turns. This is based on old Celtic traditions, where the calendar was divided into eight festivals. Four of these are Fire Festivals, celebrated at the Summer and Winter Solstices and the Spring and Autumn Equinoxes. To our ancestors, these would have been vital points in their calendar and measurable by noting where the sun rises and sets from a certain viewpoint. The other four festivals are known as the Cross Quarter Festivals, and are based around the farming calendar. 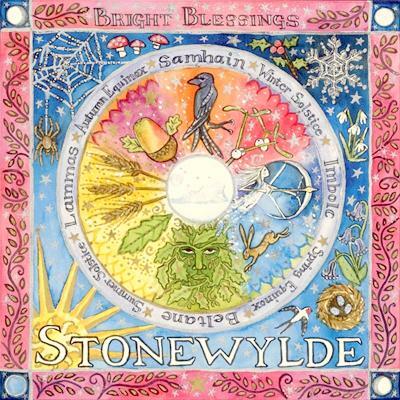 Imbolc, Beltane, Lammas and Samhain are the names used at Stonewylde, although there are other variations in the Outside World. There are links at the side of this page to each of these eight festivals, with more information. It’s the heart of Stonewylde, the place where the earth energy is strongest. Not because the Stone Circle’s there, of course. The magic came first. The circle was built by our ancestors to mark the place where the Earth Magic could be channelled. 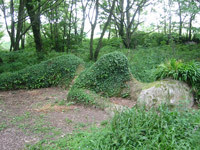 The Goddess is in the landscape of Stonewylde; the rocks her bones, the earth her skin, the foliage her hair. The concept of a sentient landscape is ancient and Stonewylde certainly appears to have a consciousness and perception of her own. 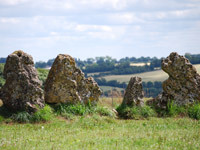 Many places are marked as sacred: the Stone Circle, the Village Green, Hare Stone, the Dolmen and on a darker note, Mooncliffe and Quarrycleave. 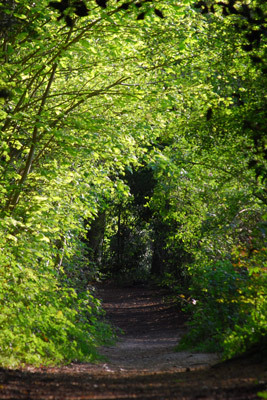 If you’d like to learn more about earth and nature-based spiritualities, there are many organisations and websites with plenty of interesting information. But to me, the very best way of reconnecting with Nature and opening your spirit to the Green Magic all around is by getting outside, in the open air, and allowing Nature to make the connection with your soul.